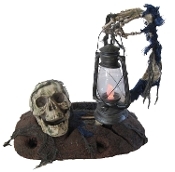 Appears as though a rotting skeleton head and an arm are breaking out of the ground holding a light-up lantern! Natural ground look base is made of hard dense polystyrene foam, and the skeleton parts are durable hard plastic, as is the lantern. Base is 19 inch x 14 inch x 3 inch tall (47.5x35x7.5cm). Life Size Skull is 8 inch tall x 6 inch wide x 8 inch deep (20x15x20cm). Skeleton arm is 26 inch (65cm) long, and is bendable at the elbow. Lantern is about 10 inch tall x 5 inch (25x12.5cm) at the widest point , and the light slowly morphs changing colors! Includes 3- Replaceable LR44 watch button batteries.